As I not so patiently wait for the 27th to come- my first trip to New York for 8 days- I'm partly feeling like I shot myself in the foot a by booking with Spirit and only planning to take a backpack because it's so much cheaper to stow under a chair than rent space up above the cabin. NYC- Fashion capitol, right? A bottle and umbrella up in herrr. It's not just a backpack either- its sleek and pretty, but SO so durable. There are 11 internal and external pockets on this baby, some inside and some out, some insulated. They call guy a fish mouth design because of its wide opening style, which stands up on its own for easy packing and storing. The only real down side to this entire bag is that fish mouth; you have to open the bag almost all the way just to reach your hand inside for a quick grab of something. However, once it's open it is really convenient to have such a wide opening because you have room to root around if need be without knocking everything out. See? Remember this shot from last year? Proof! 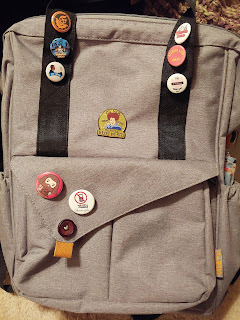 The backside of this bag sits nicely on your own backside with padding at your shoulder blades and a lower back cushion as well as cushioned straps which I can attest are actually pretty legit. It's a breathable structure, too, so even if you wear it walking around for hours until you can officially check in for your hostel stay, that 3d padding helps you from getting pooled with sweat down your spine. The straps feel nice on your shoulders. 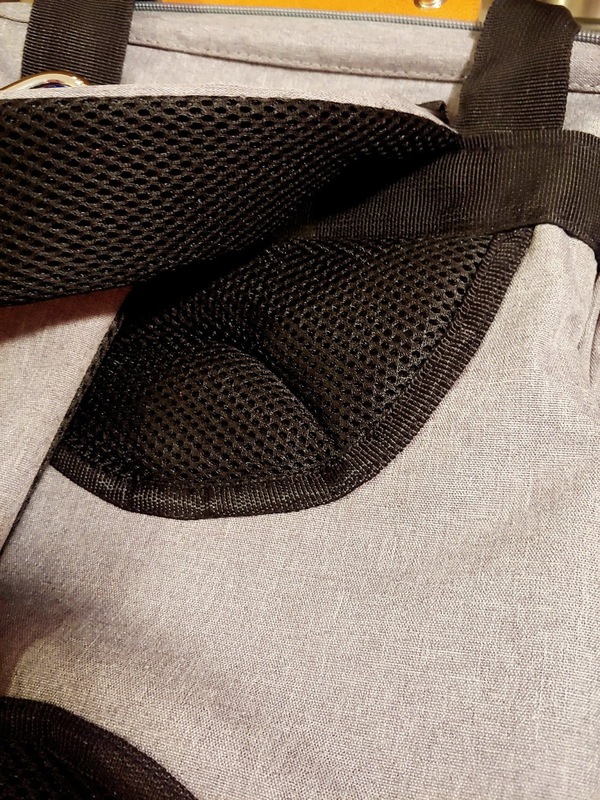 They're thickly padded with the same nylon mesh fabric as the backside panel to allow breathing, but the mesh also acts as an abrasive grab on your shoulders for a more non-slip finish no matter the feel of material they're sitting on. The look of the bag is pretty chic and modern, with an asymmetric magnetic flap over the front zipped pocket. 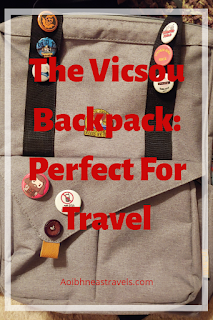 The brand name, Vicsou, is on one patch on the side, for a hide and seek style of branding instead of ugly branding graffiti. There are three large external pockets: duel baby bottle holding pockets on either side and one main pocket in front that has double security. 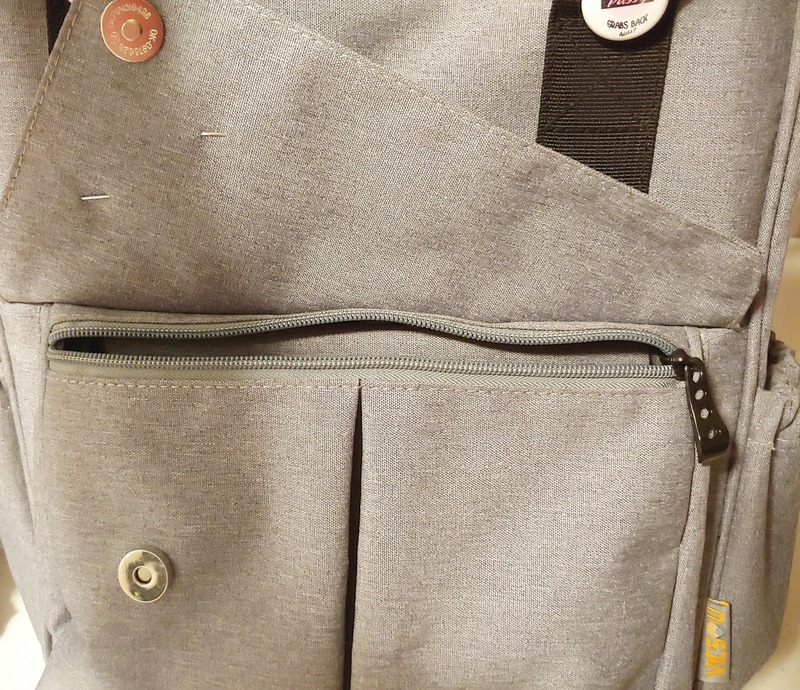 This pocket is one of my favorite features because not only does it have that extra safety of a zipper and the heavy (in magnetism) snap covering, but it's large enough for all of your need-to-grab items combined like baby wipes, phone charging cords, gum, a paperback, extra socks, almost anything. It's also the perfect spot for all that flair we all need to stand out, right? RIGHT?! Moving on to the inside of the bag seems very mysterious until you put a light on it. Through the fish mouth opening is an array of black fabric with eight internal pockets to help keep you organized. 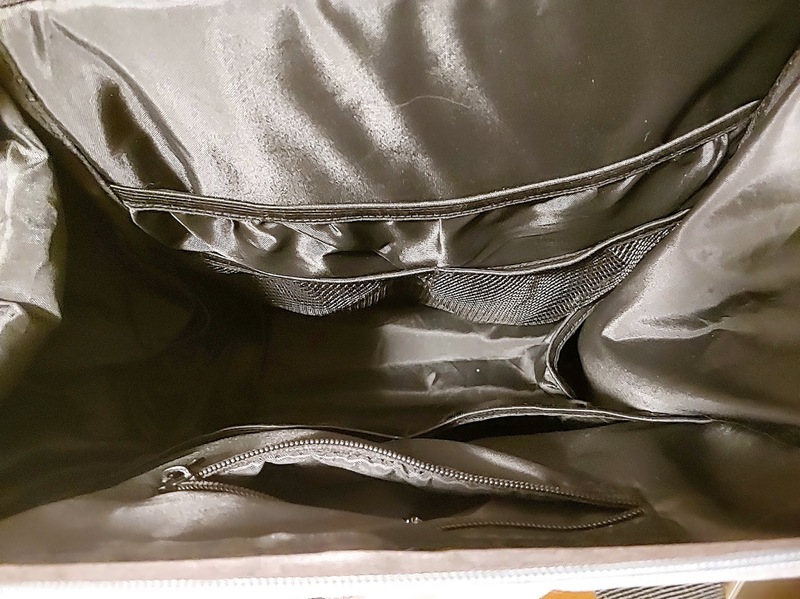 There is a high zippered pocket on the inside front, one larger pocket across across the whole back half, with two equasized mesh pockets in front of that one. There's an additional pair of bottle pockets on each side panel, which perfectly fits computer cords, or you know, bottles. Whatever. 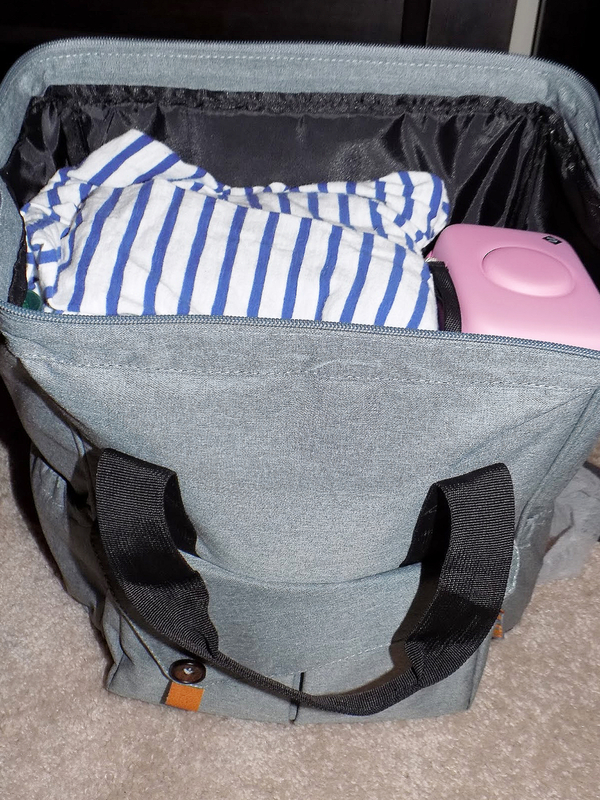 Add in two more decent sized pockets that you can actually fit your hands in and you're stowed to go. This bag has been tested for over a year- if you can still call it testing. 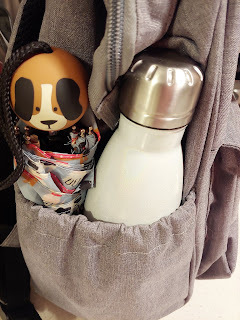 This fella has been stuck in the airport security belt, accidentally found itself sledding down a snowy hill in Chicago (no water marks either) and caught in a thunderstorm on the east coast (with nary a wet garment inside). The Oxford fabric has a higher wear resistance as one of its main strengths, is water resistant, comfortable and lightweight. Despite its whopping two pounds and lightweight fabric, it is unbustable. In over a year of regular use there is nary a thread out of place. 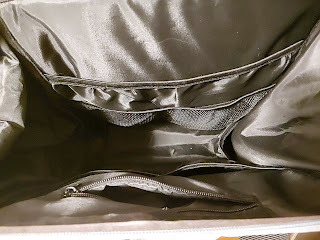 Plus, compared to a regular backpack or duffel, it can hold more weight equally without shoulder pain, sagging, splitting or crushing your goodies. As it is intended for baby gear, we can only assume that the design of the entire bag was made by someone who has had multiple children in a small time frame- the bag is sturdy, easy to sling over a shoulder and has, as of yet, virtually no risk of falling apart at the seams at inopportune times. It's darn near stain resistant and the pockets don't feel like they're able to be ripped off by jam covered hands looking for a juice box. If it can stand up against a toddler and win then I bet TSA will be a-ok. The Vicsou diaper backpack really is an incredible bag. It's unisex and appealing, but it's the quality that shines most importantly. 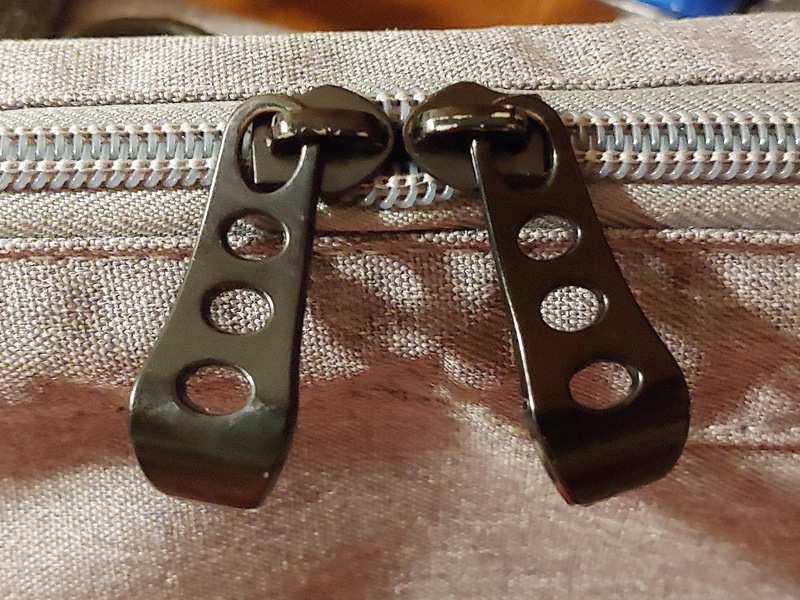 The double stitched zipper support is some of the best I've seen, and the metal holdings of this bag differentiate it not only from standard backpacks, but baby bags, also. It's a solid choice for all walks of life and will last you just as long. Sadly, it's temporarily sold out on Amazon ATM but I managed to find it on BeautifulBlueBird with a sale going on! Woo! This could be a very useful thing for traveling with young ones! Wow. I'm in amazement at how much it does and how good you are at this. Way to go! What a great travel bag! Seems like you can fit a lot in there!When ours breaks, this looks like a great option! Sounds like a great deal. I will need to check it out because I like to travel light, too! I usually travel with a big suitcase where half is camping gear. Just having a backpack would be nice and easy. I like the way yours opens so wide even at the top. What a cool bag. I would have never thought about a looking at diaper bags as a travel bag. Love it! Wow 😎 this little charmer does a whole lot and I love your description of it!